Sketches of Frank Gehry is a highly entertaining look at the man who has designed some of the world’s most unique buildings. Frank Gehry’s works are unmistakable: The Guggenheim Bilbao, the Walt Disney Concert Hall in Los Angeles, the Experience Music Project in Seattle, DG Bank in Berlin. Those are just a few of his more high profile architectural marvels. Early in Sydney Pollack’s breezy but informative look at Gehry, the architect fiddles around with one of his paper and tape models for a project. A change here, a tweak there; his assistant crumples paper, corrugates a sheet, fiddles with angles. Gehry is eccentric by design; his personality is part low profile, part egomaniacal. As one observer comments, Gehry’s Columbo exterior belies an enormous ego. Bolstered by input from numerous big names including Bob Geldof, Barry Diller, Dennis Hopper, Michael Eisner, and Michael Ovitz, all people who have either worked with Gehry or been impacted by his work, the documentary paints an inspired look at a man who himself offers plenty of inspiration to others. Among the juicy tidbits about Gehry’s past are confessions that he once failed a class on perspective, only to retake it and receive an “A.” Then there was the time, during his second year of coursework in architecture, when a teacher told him to get out of the field and pick something else to do. The comment left him devastated but determined. Eventually Gehry’s ambitions would lead him to forsake standard, generic architectural design (Geldof calls 99% of architecture “depressing shite”) and seek more artistic expression in a field besieged by suffocating, self-imposed rules and restrictions. The change in course was befitting for a man who, while starting out, found brotherhood among artists who embraced him and blank looks from his fellow architects who didn’t understand him. While hardly a total puff piece (even Gehry’s friends and associates acknowledge he can be a frustrating person with whom to work), the film would’ve been complete if it featured more naysayers. Indeed, the sole voice of dissent comes across as more of a mole, a plant tactically placed in the project to inject a negative viewpoint. It’s all the more apparent when Hal Foster, a professor of art criticism at Princeton, acknowledges he might be the only contrarian voice in the movie. His arguments are startlingly weak; “I don’t get his stuff” paraphrases most of what the man has to say. Far from displaying the mental prowess indicative of the next John Nash, Foster tries to argue that Gehry’s architectural designs oftentimes overpower the works of artists on display within Gehry’s curving, organic-feeling walls. It’s too much, too fast, he says. Come on Hal, if that’s your best argument, then the obvious counterpoint is that the art on display needs to be stronger and more worthy of the House That Gehry Built. To Pollack’s credit, he does include a montage of newspaper clippings that are far more vitriolic arguments against Gehry. But surely a man of ego would enjoy presenting his detractors if for no other reason than making a sport of shooting down their remarks. As Gehry himself argues, if the work’s no good, then let the marketplace deny it. One of the many nifty revelations of the film is Gehry’s efforts to bring his industry, kicking and screaming, into the modern age of computers. Gehry works in a virtually paperless environment (well, aside from all the paper and cardboard used in the conceptual modeling stages of his projects). Unfortunately, he deals with a lot of regulators and the like who still require good ol’ paper documentation. Gehry’s high tech operations are in stark contrast to the man himself. As Thomas Krens, director of the Guggenheim museums worldwide, points out, Gehry doesn’t know how to use a computer, except to throw it at people. 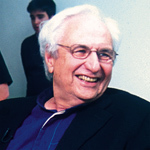 In the process of computerizing his designs, Gehry was able to grow even more ambitious as he became able to more precisely relay technical information regarding curvatures and the like to the manufacturers building out his mammoth projects. No doubt that side of him surfaced during group therapy following Gehry’s unhappy first marriage. Lacking in confidence, Gehry found the guidance he needed in Milton Wexler, his therapist of 35 years. Soon enough, the angry young man would learn to build productive personal and professional relationships. One of the keys to his professional success would be, as Wexler describes it, Gehry’s shift from trying to seduce his clients to educating them about what he’s doing. Sketches of Frank Gehry is at its most illuminating when the documentary examines the artistic influences on Gehry and his own artistic end results. It’s fascinating to learn how the Hieronymus Bosch painting Christ Mocked (The Crowning with Thorns) would provide the inspiration for the floor plan for the Museum of Tolerance in Jerusalem, a project expected to be completed in 2009. As for the results of his vivid imagination, Gehry has truly mastered the character of light and its interactions with objects. The genius of the Guggenheim Bilbao is a case in point. While Gehry was originally embarrassed by the Bilbao project, it has now become his signature building, a landmark case of a new, forward-looking facility revitalizing an entire town. To visit the Guggenheim Bilbao is to participate in a truly amazing piece of art as architecture. The building affords visitors the opportunity to create their own photographic works of art; it’s a place that screams to be photographed inside and out. Unfortunately, regardless the proximity of works of art on display, the museum’s relentless photo Nazis put a perpetual kibosh on photography within the walls of the building built with public funds. Alas, that’s a topic more applicable for 60 Minutes than a documentary on the building’s designer. Like other great artists and their works of art, Gehry at first sees all the missed opportunities once, years after inception, a project is finally built and opened to the public. Gehry uses the test of time as one of his key considerations of a successful project. And he likes the project even more if doesn’t leak. The end result of Gehry and Pollack’s collaboration is inspirational — and humorous — enough to encourage those who have been told to do “something else” and those artists who want to change the world.